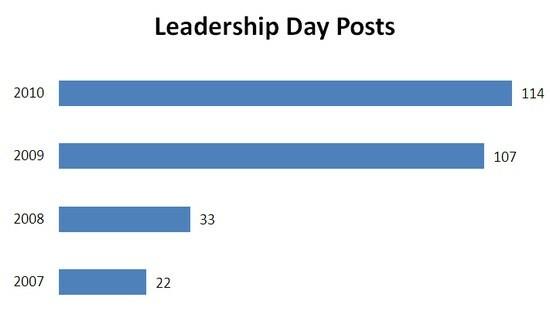 Leadership Day 2010 – The final list! Well, after sorting through all of the Leadership Day 2010 posts, tracking down incorrect URLs, deleting a few nonexistent items, and reviewing some attempts to recycle old posts, I believe that I have the definitive list of 114 total posts. You can see the updated Google spreadsheet or read through the roughly categorized list of posts below (Twitter IDs are in parentheses where available). A big, big thanks to everyone who participated this year. There’s LOTS of good stuff here, as usual. Happy reading! Blake Skidmore (@blakeskid). Pick Up the Mouse Your E-Mail is Ringing. I will be gliding through building technology at schools, and how to take some concrete steps for “old dogs learning new tricks”. Carolyn Foote (@technolibrary). Stepping out of the bubble. How can we step out of our own bubble and dream? Chris Atkinson (@ChrisLAtkinson). What Kind Of School Will You Lead This Year? Use Doug Reeves’ Leadership Matrix to assess where you are as a school and where you need to be. Chris Lehmann (@chrislehmann). Leadership Day 2010: Be The Best Version of Yourself. Being a good leader means first being a good person. Dale Holt (@Daleholt). Be the shaker. The snowglobe is best when shaken. We we lead we need to not be afraid to shake things up. Damian Bariexca (@damian613). Leadership Day 2010: From the Ground Up. Not all administrators are leaders; not all leaders are administrators. Darren Draper (@ddraper). On Administrators’ Choice to Do Nothing. My take on why change is so hard to come by in leadership behavior. David Bill (@dcinc66). Requirements for change. What is needed to institute change in a school? In my mind, they include the following – vision, understanding and persistence. David Fleming (@mrdfleming). Reflections on Leadership. What I expect from administration regarding technology use in school. Ed Allen (@horizons93). Leadership Day 2010 – The Time Is Now. Let’s adopt an admin and give them a supportive push! Heather Hersey (@hhersey03). Tech Leaders, Don Ginty and Rob Mancabelli. A profile of two technology leaders and how they approached a school’s tablet program and 1:1 pilot. Jaime Dial (@DrDial). Never be afraid to lead. Be careful when making generalizations about leaders; you don’t have to be an administrator to lead. Jeff B (@jbtheater11). Leadership Day 2010 – A letter. A simple (but kind of frustrated) letter to any administrator with a few suggestions and book recommendations. Jeffrey L. Hunt (@jeff_hunt). We Need Educational Leaders Who Can Move Us to the Next Level — Forward is Not Far Enough. It’s time for leaders to take schools to the next levels, embrace digital technologies and focus on learning. Joe Bires (@joebires). Learn by Doing. Schools should practice what they preach; learn by doing. Jon Becker (@jonbecker). Who are the thought leaders in educational leadership? Where I throw ed. leadership professors and school leaders under the bus, only not really. Jonathan Ferrell and Britt Pumphrey (@jonathanferrell, @brpumphrey). Moving Forward. Two young teacher’s perspective on what it means for a leader to be moving forward in the realm of technology and education. Jonathan Martin (@JonathanEMartin). Learner-in-Chief: Leading in 21st century education. Today more than ever, leadership is about learning, and those of us who aim to lead learning must be ourselves Chief Learners in order to be Chiefs of Learning. Kristen Swanson (@kristenswanson). Leadership Day 2010. Upgrade and supercharge your leadership with these ideas! Linda Clinton (@Linda704). I’m Not In It to Win It I’m In It for You. A post inspired by a line from a pop song. Lisa Winebrenner (@EdTech4Me). Leadership Day 2010 Call to all bloggers. Reflection of last year’s post to this year and links on how far Google Apss Education Edition has come in 4 years. Megan Howard (@mmhoward). Leadership: Adapt, Innovate, and Inspire. Musings about verbs: adapt, innovate, inspire — and why walking slowly through the halls is a sign of good leadership. Michelle Baldwin (@michellek107). Leadership Is… In thinking about leadership, I wanted to be less preachy than I usually am, and instead concentrated on qualities of good leaders. Mike Meechin (@innovateed). Tough Conversations – Have Them! Calling all education reformers! I encourage you to find those in charge and have them sit for the tough conversations. The movement begins here, with us, and these conversations. Nathan Barber. Administrators as Technology Leaders: Is Being Tech-Savvy Enough? Administrators must understand not only the limits of their own tech knowledge but also when to empower tech experts to carry out the technology vision for the school. Pam Moran (@pammoran). Staying Relevant as Leader and Learner. I fear being dangerously irrelevant so I work hard to stay relevant as leader and learner- with a little help from friends, both F2F and virtual. Patrick Larkin (@bhsprincipal). Leadership Day 2010 – Two of My Goals For This Year. Resource sharing rather than resource hoarding. Pernille Ripp (@4thgrdteach). Do You Dare to Look in the Mirror? Reflection on whether you are a multiplier or a divisor. Queenie Lindsey (@tandemteaching). An Open Letter To Administrators| Leadership Day 2010. Dear Administrators: 3 teachers reveal exactly what they need from you to implement technology in the classroom. Renee Moore (@TeachMoore). Dear Angela. A heartfelt letter to one my former students, now an elementary principal, encouraging (not shaming) her to explore what technology integration can do for their school, especially for our high-poverty, digitally disadvantaged students. Rodd Lucier (@thecleversheep). The Three ‘R’s of Educational Leadership. Educational leaders need to take Risks, to conduce Research, and to build Relationships. Roger Crider (@rcrider69). Its not that difficult. Why doesn’t administration understand that with a little vision and commitment things would improve greatly. Roger Pryor (@pryorcommitment). Paintings in an exhibition: change metaphors and a couple of views on leadership. Sometimes we may feel the urge to charge into a battle for new ways of doing things, trumpets sounding and hooves thundering. There is a quite satisfaction to be had, however, from ‘leading from behind’ and seeing some of the more clever cows lead the herd to new grazing. Scott McLeod (@mcleod). “No thanks. I choose to do nothing.” Are school administrators guilty of ‘willful blindness’ when it comes to the societal transformations that surround them? Selena Ward (@thetechtiger). I Have Some Hope. This is my yearly letter to my principal. Sheryl Nussbaum-Beach (@snbeach). Leadership Day: A Day Late. Leaders “kill their TV” to make time for Design Thinking: Inspiration, Ideation, and Implementation to reculture and shift their school/district. Sylvia Martinez (@smartinez). What leadership looks like. “What works” is variable to an almost maddening degree. Tim Gwynn (@tgwynn). How About Some Walk To Go With That Talk? When it comes to technology in schools, leaders are talking about it all around us, but the talk doesn’t mean much until they step up and start using the technology as well. Tim Stahmer (@timstahmer). What Do You Do All Day? Does the leadership in your school have an “insanely great” approach to their role like Steve Jobs? Todd Williamson (@twilliamson15). Consistency, Vision, and Bravery. Three necessary values for any educational leader, in any century, with or without technology. Tony Baldasaro (@baldy7). Reflections on 2st Century Leadership. Reflected upon the 21st century leaders and offered three traits of high quality leaders, one of which a former boss of mine did not have. Tony Keefer (@Tonykeefer). Big Thinking: Leadership Day 2010. One teacher’s ideas that may help administrators think big about embracing tech. Dave Meister (@phsprincipal). Leadership Day 2010 Practical Steps to Promote Technology Integration. You too can be an administrator that is leading technology integration in your school! Dolores Gende (@dgende). Leaders Among Equals. The six BEs that educational administrators demonstrate while BEing Leaders among Equals. Justin Tarte (@Justin_Tarte). What should busy administrators be reading (or watching)? – Leadership Day 2010. Top ten for aspiring, new, current, and retired administrators who want educational and technological reform in an educational setting. Mark Carbone (@markwcarbone). School Administrator To Do List. School admins are busy and wear many hats, they should focus on a critical ‘to do’ list. Mary Beth Hertz (@mbteach). My Top 10 To-Do List for Administrators. A (hopefully) succinct checklist of things Administrators can do to make sure they are leading their school into the 21st Century. Morgan Kolis (@Room5Friends). “Leadership Day 2010” (What would I want my administrator to know about technology?). This post provides a list of 10 things I would LOVE for ANY administrator (principal, special ed. director, curriculum director, Superintendent, etc.) to know about TECHNOLOGY IN REGARDS TO SPECIAL EDUCATION (Yes, the two really can go hand in hand!). Natalie Wojinski (@mswojo). Leadership Day 2010: Dear Administrators. Administrators, just follow these five simple steps to a happier, healthier technology integrated school. Steven W. Anderson (@web20classroom). Some Questions To Ask… What questions should educational leaders be asking in their buildings for districts everyday? iNACOL (@nextgenlc). Leadership Day 2010: Online and Blended Learning. This post provides a quick summary of how blended learning models can be beneficial, as they provide learning opportunities that may not exist elsewhere. Becky Searls (@beckyjoy). Leadership Day 2010. How one district provided laptops for teachers…with a catch! Justin Bathon (@edjurist). Rubber … Meet Road: Leadership Day 2010. Lessons and challenges from leading a real statewide education reform effort in Kentucky. Maryna Badenhorst (@marynabadenhors). Visionary Leadership and e-learning. The roles and responsibilities of schools in the integration of e-learning: Where will we hide in this e-learning storm that is brewing on the horizon? Taber Akin. Leadership Day. A small list of technology successes in ISD 191. Cheryl Oakes (@cheryloakes50). Leadership Day 2010 call to action be part of this! A group of administrators and technology coordinators went into action, collaborated and designed a summer professional workshop for any administrator involved in evaluating staff, in Maine, presented by local teachers who are already demonstrating the NETS-S standards in their classrooms. Jon Orech (@jorech). More Than Just a Spark. The start of a new school year brings optimism and new ideas; how do we sustain them long term? Kyle Pace (@kylepace). PDopia: Planning The Perfect PD. Want to evoke real change and move forward with educational technology? It all starts with providing quality PD to your staff. Mau Buchler (@maubuchler). Only After You’ve Done Your Homeplay! A more effective way of doing PDs for teachers who want to start using technology. Paula Naugle (@plnaugle). 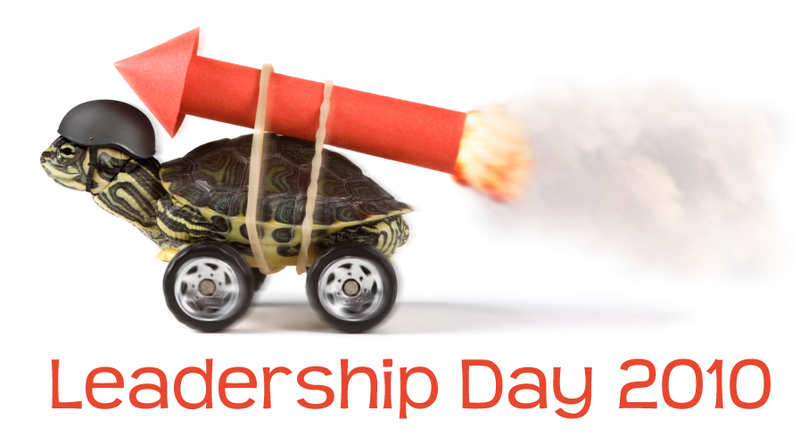 Leadership Day 2010 – My Take. I suggest 10 ways leadership can “walk the talk” about integrating technology when doing staff development. Mark Barnes (@markbarnes19). Mr. Education Administrator: tear down that wall. Ronald Reagan may have said it first, but it’s worth restating: Mr. administrator, tear down that wall — the firewall that is. Beth Still (@bethstill). ISTE NETS for Administrators: How Do You Measure Up? This post goes through the five NETS for Administrators and provides some insight from the perspective of a teacher as well as provides a jumping in points to help administrators become tech-savvy. Doug Johnson (@blueskunkblog). CODE 77Rubrics for Administrators. 10 Rubrics to help the brave administrator judge his/her competence with technology use in schools. Alynn Coppock (@ACoppock1). Driving Toward a New School Year. After reading Drive by Daniel Pink, I was inspired to blog about this thought-provoking read and how it relates to leadership and the 1:1 environment. Amanda Dykes (@amandacdykes). Time To Step Up. I am not a leader, far from it, but I have a big mouth and not afraid to use it! Barbara McCormick (bmccormick65). Leadership Day 2010. Going Global with 1:1 inspires a community. Becky Fisher (@beckyfisher73). Educational Leaders Must Be Self-directed Learners. “Nobody told me I had to…” is not an excuse for a leader. Brad Flickinger (@bradflickinger). Exploit Their Passions. A How-To Guide to Exploiting Your Teacher’s Tech Passions. Brian Ford (@bf_teach4chnge). Marx and School 2.0: My Leadership Day 2010 Post….In Time for Happy Hour (somewhere)… Using Marx’s idea of liberating the means of production as an analogy for school and tech leadership. Bridgette Wagoner (@B_Wagoner). Pragmatism is Not the Answer, Part II: Tech Integration. We are so concerned with fast, practical results that we’ve forgotten that real, substantive, lasting change happens as a result of changing the underlying belief systems of individuals. Carl Anderson (@anderscj). An Invitation Letter to Parents. In this post I show how online Personal Learning Networks (PLNs) can be leveraged to effect change in your school and increase parent involvement in support of student, teacher, administrator, and systemic learning. Catherine Victoria Parsons (@vgloucester). Make Learning a Quest. Learning should be more like questing in an MMORPG – embrace the process and not the target. Cathy Stutzman (@Stutz01). Collaboration and Lemon Pancakes. What would school be like if every teacher could engage in meaningful conversations with school administrators about curriculum and educational pedagogy and if every student could learn alongside teachers and administrators? dan greenberg (texasbuckeye). Leadership day 2010. How can we get administrators to make honest assessments about technology they, themselves, might not fully grasp? David Edwards (@davencvps67). Are We Helping the Trophy Kids Learn and Grow? Are we meeting the expectations of the “trophy kids” (the net generation) with the learning environments we build? Dominic Giegerich (@Giegerich). Aretha said it best – “R E S P E C T” Sit teachers down like 3rd graders in PD or treat them like adult learners and give them the respect they deserve? Edna Sackson (@whatedsaid). Learning Principles. Know what you believe about learning, before you think about implementing change! Eye On Education (@eyeoneducation). What role does technology play in differentiated instruction? Some administrators feel that if classroom teachers use technology in their classrooms that their classrooms will “automatically” differentiate. What role does technology play in the differentiated classroom? Jonathan Cassie. Technology and Education 1.0. The Greeks got it right; our use of technology has to catch up with what they taught us 3000 years ago. Josie Holford (@JosieHolford). More Educator Luddites Please. A call to reclaim Luddism and to build a class of educator Luddites who can learn and lead against the grain of narrowing definitions, factory school and standardization and toward what it means to be an educated citizen in a networked world. Michael Shepherd (@smichael920). Curriculum Design. What does our pedagogy look like? What would you like learning to be like? Paul Bogush (@paulbogush). Acoustic Teaching. It’s the songs we write and sing as teachers that make a difference, not the instruments we play them. Rich Haglund. The 1908 ISTE NETS, or, how chalkboards revolutionized teaching. The ISTE NETS-T could have been written 100 years ago, and teachers who haven’t mastered their subject don’t have room in their brains to contemplate using (or letting students use) new tools to teacher (or for students to learn) the material. Rob Jacobs (@eduinnovation). What Do You Think You “Hired” Your Technology To Do? When leaders put education technology into the hands of students they discover that new tools, in new hands, creates new and often unanticipated results. Robert Dillon (@ideaguy42). Hitting the Target, Missing the Point. Winning the testing war is great, but truly preparing children for the future is morally responsible. Ryan Bretag (@ryanbretag). Walk in the Shoes of Your Students. On this Leadership Day 2010, I issue this challenge to school leaders: walk in the shoes of your students for a day. Sean Nash (@nashworld). Principals as Teachers. An invitation to bring principals directly back into the fold of teaching through the use of modern digital tools. Sean Nash (@nashworld). Principals as Teachers Part II – Early Feedback. Part two of an getting an idea “on paper” about employing principals to become intimately empowered in a digital teaching landscape. Stephen Lazar (@SLazarOtC). Technology is a Tool. Administrators need to remember that technology is a means, not an end in itself. Steve Moore (@stevejmoore). What Are You Building? Whether we use TNT or a telegraph, we need to learn how to use technology to break down the barriers of learning and relationships. Cheryl Robson. Beyond Techno-Bling: When Boring is Good. Let’s get past the bells and whistles and really put the technology to work for us. David B. Cohen (@CohenD). Tech It From The Top! If you’ve lived this long, and you believe in lifelong learning as one of your professional principles, then it’s time to do more than use email and Facebook: isn’t it about time to retire the “aw, shucks, I can’t use any of that new-fangled technology stuff the kids use” excuse? Frank Buck (@drfrankbuck). Leadership Day 2010: Why Blog? For the principal who wants an easy way to communicate with faculty and staff that is fun for both reader and writer, a blog is the way to go. George Couros (@gcouros). #LeadershipDay2010 – The Tools I Use. I am smarter because I found a bunch of smart people. Ian McCoog (@imccoog). plain and simple, the blog. It’s nothing fancy but blogging is one effective and not “too high tech” means of communication. Jacob Williamson. Good Intentions. Why good intentions aren’t enough. Joquetta Johnson (@accordin2jo). What Tools Are You Carrying In Your Digital Briefcase. Briefcase, backpack, or brown paper bag… It’s not about the container, but its contents. Karen Weil (@KarenTBTEN). In the Clouds: Cloud Technologies… and Start Pages. Can a well designed ‘start page’ link elementary students with engaging (and safe) technologies? Lyn Hilt (@l_hilt). Leadership Day 2010. Reflecting upon the things I’ve done as an administrator to help my teachers “rethink” their practices. Monte Tatom (@drmmtatom). #LeadershipDay10. The value of staying current with 21st Century Leadership Skills. Pattie Thomas (@pthomas1). This Blog Belongs to YOU! Parents and the community deserve to know what happens behind the doors of the school house. A blog does just that!. Susan Carpenter (@SusanF95). Have Terabyte…Will Travel. This is the most amazingly convenient way to have access to everything you need, all of the time, from anywhere! What a tremendous list of posts by truly inspired educators. This must be an exhausting undertaking. Thanks so much for your efforts.